Online marketers have used the term “landing page” for many years to describe a sales tactic focused on getting people to take one, specific action. Today, landing pages have simply become a required element in the marketing toolbox for every imaginable business, including local brick and mortar types. A landing page is just the page people land on because an ad or email directed them to that specific page as opposed to your site’s homepage. One of the best ways to get your site to rank higher when people search locally and on mobile devices is to have lots of local content. Creating landing pages that feature very localized, down to the neighborhood perhaps, content is a great way to start building the local content and link necessary to have your pages move up in the search index for local search. Sending your LinkedIn, Twitter and Facebook connections to landing pages that are personalized to each network is a great way to deepen the connection. By running Twitter and Facebook feeds on these pages and acknowledging the connection with those that come from those networks you will also find a much higher degree of engagement in those networks. By creating landing pages that address the specific market segments, product segments or key content segments for your business you can begin to better funnel people to the specific types of content they desire. Using a tool like Survey Funnel in conjunction with your landing pages could allow a visitor to tell you what they are looking for and be directed to specific content based on their choices. Landing pages are your lead capture workhorse. 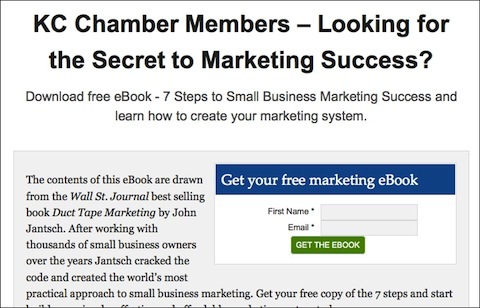 If you have a great eBook or free workshop to promote you may want to create signup forms for most of your web pages, but your signups will soar when you create a page that details, sells and demonstrates the benefits of acquiring your free report. A landing page with video, audio, images, descriptions and very intuitive call to action is a must for lead capture campaigns. Any form of advertising will be much more effective if it is targeted to a page that contains nothing but content that supports the message in your ads. The more relevant the page to the ad, the more effective. Smart marketers constantly experiment with ad and landing page combinations, including creating keyword optimized pages for specific groups of PPC ads. There are many resources geared towards helping you create landing pages, but my favorite at the moment is Copyblogger’s Premise. I run my entire website on WordPress and Premise is a WordPress landing page plugin that gives me total flexibility in the creation of landing pages. The tool includes predesigned configurations for sales pages and opt-in pages and is very easy to configure and style. A tool like Premise is a must if you plan to take today’s advice to heart.